Poured from a 12 oz. bottle into a shaker pint glass. A: Initially hazy but clearing, medium golden color with one finger of persistent off-white foam head. Heavy lacing remains on the glass. S: Strong pale malt is rustic, toasty, and appealing, with a whiff of fermented honey. Hops are grassy and floral, fairly bright, with a gassy hint of carbonic acid evident. T: Begins dry, with grainy malt amidst weak herbaceous and mixed citrus hop aromatics. Acidity is pleasantly moderated. Sweetness peaks in the middle as malt turned to honeyed pilsner and hops become medicinal and astringent, but stay passive. The finish is moderately bitter and more dry than the middle, with a lingering flavor of apple juice detectable. An overall heaviness pervades all portions of the taste, stemming from a distinct quality of fermentation that is slightly oppressive but stops short of being boozy or tasting of raw ethanol. M: Medium viscosity, substantial and surprisingly sticky on the palate, with moderate carbonation. D/O: This IPA is appealing despite some inconsistencies in flavor, in large part to its light and bright sensory profile and its low ABV for the style. It may make the critical drinker reflect that they don't know why they keep drinking, but they do. This is a really nice bitter IPA. The appearance is pretty standard for an IPA, with a somewhat orangish hue and a whitish cream head that laces beautifully with each draw. The nose is a bit floral, and the palate is surprisingly malty for an IPA, but the bitterness kicks off on the palate and follows right through beyond the finish. The mouthfeel is a bit thick, but very smooth. Well done. This beer poured a bit pale for a west side IPA but did have a nice 2 finger head. Nose was subdued although there were some piney and citrus notes present. Flavor, I was not impressed and would have expected more from Widmer. It just lacked the bittering qualities demanded by this style. Mouthfeel was a bit loose, in fact somewhat watery and the body was to light. Overall the beer tasted fine as far as beer goes, but it is not a great IPA. Overall, this is a great and balance IPA. Smelled of light citrus and some perfume, and heavy hops. A little flat on the carbonation and surprisingly watery. The flavor was a little dull with some light flowers, but the flavor was balanced and not too overpowering like some IPAs can be. Nice golden tint with a fruity hop filled nose. Nice lacing that reminds me of waves crashing in on the ocean and the legs drape the side of the glass while slowly gaining momentum to reconnect with the nectar. The head is white and full on top with very little spotting. Slight carbonation burn in the nostrils but balanced out with the hops in the retro-olfaction. This is a medium bodied nectar that is well balanced between citrus and earth hop tones. Picked up a Widmer craft pack. Had avoided this one for some reason up to now, im sorry i did. pours a dark straw color with little to no head. Smells strong hops, bit of citrus. Tastes pretty much like it smells. Strong hop flavor, more than expected. Its a bit watery, but not too bad. The bitterness prevents this from being easy drinking, but still a pretty good beer. This wheat colored beer was poured into a pint glass. As the foam of a finger receded to a faint wisps of lacing the aroma of sweet hops, coriander, and floweral greets the nose. The taste of the beer is that of Sweet hops, coriander, and citrus tones. Overall a great beer to have if craving a IPA. This is one of my favorite session IPAs. This Broken Halo has a great citrusy flowery aroma. It pours into my favorite glass caramel like, with a full white, to off white head that stick around a while. The flavor is outstandingly citrusy and hoppy, with a little lovely bitterness in the background hidden by the subtle sweetness of the malts. And the beer is incredibly smooth... medium bodied, no harshness. Thank you Brothers. Served in a bottle poured into a pint glass. A- Clear yellow coloring with a lot of head. Very similar in appearance to a macro. S- Very hoppy aroma, but not necessarily strong. T- Not as hoppy as I thought it would initially be judging it by the scent. Somewhat sweet. Can't really taste the presence of any malts. M- Very, very smooth beer. Not very hoppy at all. D- Extremely smooth and extremely drinkable. 12 oz. bottle poured into a Duvel tulip. Nice looking golden orange beer, slightly cloudy with a finger and a half of off-white head that lingers a long time. Decent lacing. The smell is a gentle blend of oranges, flowers, baking bread and a some mild spiciness. Maybe a bit too gentle. Much like the smell, the taste is an exercise in restraint as well. Orange, apples, fresh bread, a bit of grapefruit and spice at the end. Mouthfeel is good. The moderate level of carbonation is just right. Overall impression- Nicely constructed, well-balanced IPA. The lack of any over-the-top flavors make for a very drinkable brew. Good reminder that a nice IPA needn't be a hop bomb. Huge IPA fan here, but more lean to the Pales... I kind of miss easily finding Widmer Hop Jack Pale around here.... although to me it wasn't hoppy enough. 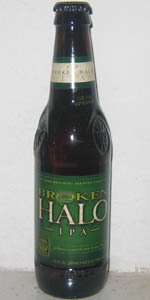 Broken Halo is a great IPA... kind of what I think A real IPA should be. Love the Hop notes and especially love the drinkability of this one. Widmer is doing a fine job with their Ales. Smells great, like old memories of your first beer. Tastes like the freshest hops... somewhere far from the industrial district of the brewery. Goes down with ease and sits well. Only sour note for me, is that it makes me sleepy much like a wine would do. Otherwise.. can't pick a favorite between this and Hop Jack. This one pours out a golden yellow. Smell is a bit malt, and a bit hops, with floral scent. The taste is bitter white grapefruit, flowers, and a hint of malt. Prickly carbonation. Wouldn't want more than a couple of these in a sitting. I like the bitter flavor though. 12 oz. bottle poured into tulip. A light straw color with bubbles of widely varying size in a short head with some good lacing - I think darker beers are more purdy, but this will do. Has a typical nice piney hoppy smell. The taste of this one is very pleasant to my palate. It's very hoppy, but not overly bitter due, I think, to a nice toasty malt backbone. At 6% it's not overly alcoholic, which is actually nice in this era where most well-made beers are getting into the 9% range routinely. Not too much else to say about this one except that it's a very nice American IPA that is probably an excellent session beer, and I'll probably use it that way during football season. T-Somewhat hoppy. A balanced hoppiness, a zing from something different than the average Cascade or Centennial? D-Easy drinking, lacking something to make it standout. Poured from a 12oz bottle into a clear pint glass. Bottled on July 22, 2009. Six pack on sale for $5.99 at local grocer. A-Poured a golden orange hue. Only about a 1/4 inch head and scant lacing. S-Piney and citrus hops, especially grapefruit, or tangerine. A hint of malt sweetness in aroma. Very pleasant and better than expected. T-Very hoppy, but balanced by a nice malt presence that is faint, but not sweet. Bitter up front, but finishes without the taste buds being assaulted. This was better than I expected. M-Smooth and well balanced. Nice carbonation level. D-This went down very easily and I would readily reach for another. Taste improves as it warms. A good West Coast IPA. This is the first Widmer beer I have tried. Not sure why I have waited this long. Not spectacular, but a very appropriate interpretation of the style. And at $5.99 a six-pack on sale, the value is excellent. Will enjoy this again. Bright gold clear body with very little head that has poor lacing. It has a light flowery smell with a little hint of hops poking through. Smooth bubbly mouthfeel. I think this is a nice summery beer with a good hops finish taste. Good average beer. P.S. (just to make the 250 min. characters) This a good beer, but nothing to write home about. Flavor: Solid hop front, backed with citrus and pine. Not very bitter at all. From the bottle, served in an American pint glass. Decent IPA. Not bad, not amazing. Might as well grab a Stone. Your standard IPA minus some hops. Pours a golden color with little head. Smells of malty sweetness with some slight citrus hops. The taste is fairly bland for an ipa but there is some nice citrusy hop flavor towards the end. Mouthfeel is clean and easy to drink. Overall a decent pale ale... Although I wouldn't classify it as a traditional ipa. Had this for the first time w/ elrogish. Cool little pour, dark amber. Heavy lace. Nice hop aroma, seems like the traditional variety, cascade, chinook, centennial. Taste, good beer, average citrus hoppy, not bracingly bitter, enough malt to give it a good chewy feel while remaining dry and only positive aftertaste consisting of a mildly hoppy mouthfeel. Caramel. This is a good ipa you can give to people who are ready for bigger and better things from beer. Very pleasant, better than average price for these. Poured from a 12 oz. bottle, bought in a six-pack. Appearance - Clear and golden ale with a soapy white foam that doesn't retain long but does lace nicely. Smell - Very floral hops with strong pine scents. Taste - Crisp and clean with a good pine and citrus hops bite. A very tasty IPA with a good clean and fresh flavor. Mouth feel - Crisp and slightly bitter up front, give way to a nice smooth citrus hopped aftertaste. Drinkability - A perfect ABV for this style and very drinkable. I will definitely buy this again, as it's one of the better American IPA's I've tried (and I've tried quite a few).